Special thanks to Mysticks1 on the Celebrity Cruises forum for this idea. I would like to begin to assemble one for Royal Caribbean. To the moderators, I would appreciate if we could make this a "sticky" at the top of the page for all to see. Every week or two I will post a PDF for all the ships and cabin information compiled here. Please, refrain from posting cabin questions here so this can purely be an informative thread, especially for those that are first time cruisers or seasoned cruisers looking for a great cabin. Quiet Stateroom? (With comments on problems) –Located at the very aft on the stern of the ship, it is a very quiet location with no hallway traffic. Balcony View - Give comments on view, noting if location of any obstructions was an issue. – Aft stern balconies give 180 degree panoramic views but are considered an obstructive view on the voyager and freedom class ships because of the superstructure on the rear of the ship. The higher the deck, the less obstructive. This deck 7 corner aft has a 6 foot side porthole that makes the covered balcony feel more open and also affords the only straight down aft water view on these classes of ships. Balcony Size? Normal or oversized for class? 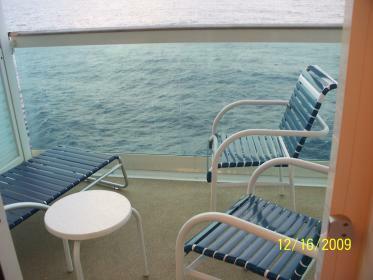 - Deck 7 corner aft balconies are HUGE with 2 chaise lounges in addition to the standard 2 chairs and small table. Was wind a problem? - No. Aft balconies are more sheltered from wind. If an aft cabin, was soot a problem? - We have not had a soot problem on the Navigator. Any specific problems with this cabin? 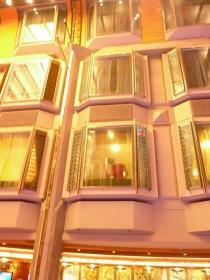 - Aft balconies are HAUNTED :eek: so people should avoid booking them (save them for us instead :p). Any other comments? - The cabin is a standard E1 (loveseat vs. sofa you would get in a D1). Some people say there is more motion being aft but we did not notice this. Some people don't like the infrastructure at the back of the ship. The balcony is not stepped but completely covered by deck 8 above. This keeps it dry in the event of rain but does limit the amout of sun it receives. There is some light pollution and sometimes noise from crew deck 5. It is a LONG walk to the elevators (which entitles you to TWO desserts!;):D). Quiet Stateroom? (With comments on problems) –Very noisy from carts in the Windjammer all day and all night. If an aft cabin, was soot a problem? - Yes, we had a major soot problem one night on the Independence. Quiet Stateroom? (With comments on problems) – Mostly. There was a bit of noise from the Windjammer above, mainly as they were setting up in the morning. Balcony View - Give comments on view, noting if location of any obstructions was an issue. – Unbelievable! Views to portside and aft, no obstructions. If an aft cabin, was soot a problem? - Only while in port - Radiance class now have diesel engines for use while docked or tendered, and there was a bit of soot as a result. When the ship was underway we didn't have any issues at all. Any specific problems with this cabin? - the cabin steward was uninspired, but they rotate. Any other comments? - 1100 is one of my favorite cabins, 1602 being the other. Quiet Stateroom? (With comments on problems) – Yes and no. Quieter than I was led to believe a PR room on Deck 6 would be. We could hear muffled sound from the parades, but the window was double-paned and it was incredibly muffled. 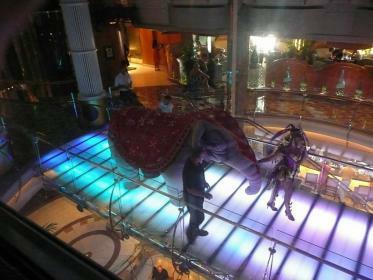 The biggest noise we heard every night was Latin music from Bolero's two decks down - it comes directly up the Centrum. I'm a light sleeper and was worried about the noise, but it was incredibly muffled. It lasts from after dinner until around midnight or so. Throughout the late night, morning and afternoon, we never heard a peep from the promenade or neighboring cabins. Was stateroom a connecting stateroom? - No, thankfully! Balcony View - Give comments on view, noting if location of any obstructions was an issue. – No balcony. Any specific problems with this cabin? - If you want a great view of the parades from the cabin, this isn't the one for you. The view is of the Centrum and not the Promenade. We had a great view of the bridge in the Centrum and watched the parades set up - it was also fun to people-watch those crossing the bridge. Any other comments? 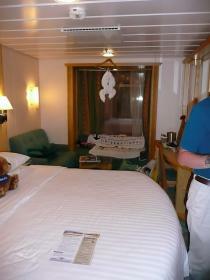 - This cabin is in a great location - great access to the rest of the ship from the aft staircase (2 rooms down). It's incredibly close to the aft staircase and the MDR, one flight up from Guest Relations, and with easy access to pretty much anywhere else in the ship. We loved being a 2-minute walk from the promenade. It's not an end cabin--it's the middle of five--so you don't hear common area/staff noise. Perhaps the only better PR cabin we can think of would be the one directly across from 6327, since it wouldn't pick up Bolero's noise the same. However, we loved 6327 dearly -we have rebooked it for next year. #1: View of 6327 from bridge in front of Guest Relations. #3: View of parade set-up from 6327. Quiet Stateroom? (With comments on problems) – Yes, except on the 70's night when the music from the Centrum was heard until 11PM. There was no noise from the elevator lobby at all. Balcony View - Give comments on view, noting if location of any obstructions was an issue. – Baclony is directly aft of the Elevator shaft, the view forward is obstructed by the hump. Balcony Size? Normal or oversized for class? - Oversized, at least twice as large as the regular balconies. Any specific problems with this cabin? - I expected that having the hump right beside us and upwind that smoke from other balconies would be limited and maybe it was, but we still got "blow-back" from balconies aft and below us, maybe the air was swirling behind the hump. Any other comments? 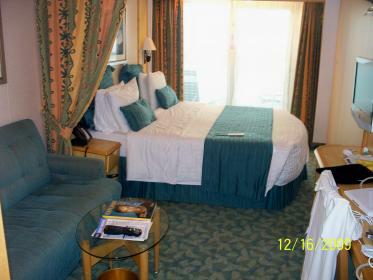 - I would book this stateroom again. It was convenient to the centrum and stairs / elevators. No noise that bothered our sleep. The balcony size was great. No balcony neighbours to the right ( forward ). Balcony View - Give comments on view, noting if location of any obstructions was an issue. –Great view! Any other comments? -The cabin is one of the 2 most forward hump cabins which was a nice surprise . It is parallel to 8338 wich appears to be more forward on the RCCL deck plans. All the hump cabins are great locations...close to everything....no noise from elevators, etc. Quiet Stateroom? (With comments on problems) – Mostly quiet, the only noise we heard was when we left our balcony door open and the deck 4 crew relaxation area was in party mode (sometimes to 3 am) With the balcony door closed, no noise was heard at all. Balcony View - Give comments on view, noting if location of any obstructions was an issue. – Fantastic view, no obstructions. Can see more to starboard than port. Quiet Stateroom? (With comments on problems) – Absolutely no problems! Balcony View - Give comments on view, noting if location of any obstructions was an issue. – Looking up we could see the Solarium hot tub area. Nice to assess whether it was busy or not. Looking down we could see people's hump cabins. Otherwise, just a standard balcony. Any other comments? - Great location! We were close to the elevators, which was nice and there was never any problems with extra traffic due to elevators, etc. Balcony View - Give comments on view, noting if location of any obstructions was an issue. – View was wonderful! Some "obstruction" from the aft structure, but the size of the balcony made up for it! Balcony Size? Normal or oversized for class? - Way oversize! Any specific problems with this cabin? - None for us. Some may not like the rather long walk aft. Any other comments? - There is a crew area on deck 6 that can sometimes be a source of "noise". Many crew members made phone calls there. Balcony Size? Normal or oversized for class? - Normal to slightly undersize due to the curve. Any other comments? - Would probably not select this stateroom again due to the odd shape of the balcony. Balcony View - Give comments on view, noting if location of any obstructions was an issue. – Good view since it is centered on the hump. Quiet Stateroom? (With comments on problems) – Deck 11 is pool deck and heard running during the day. We slept without a problem at night. Balcony View - Give comments on view, noting if location of any obstructions was an issue. – Look down and you see the lifeboats. Look straight out to the ocean. On our cruise we were docked in Nassau with an unobstructed view of the waterfront. 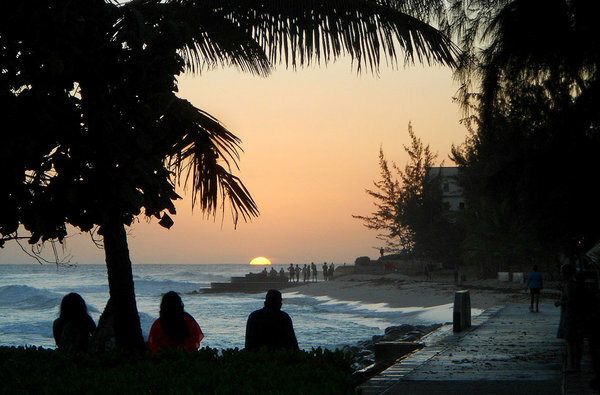 We could see all of Coco Cay on our stop there. Was wind a problem? - Not at all....I wish there was more of a breeze. There was a sizable overhang. Any specific problems with this cabin? - There is a tub but it's not normal sized. Anyone over 5 foot 8" will need to bend your knees to take a shower. There is really nothing "suite" about this room. It was tiny. 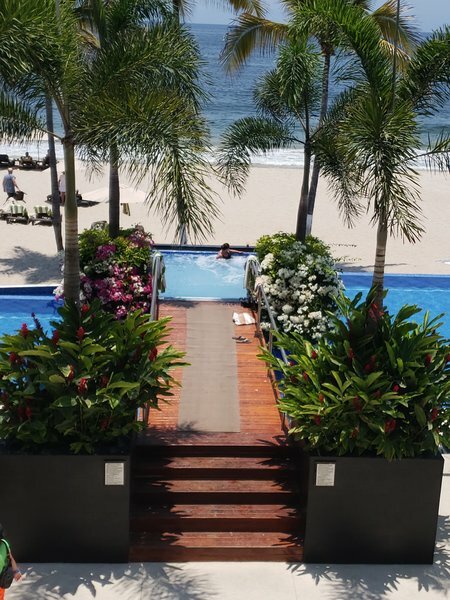 Only reason to book it is for the balcony. Quiet Stateroom? (With comments on problems) – Yes, very quiet. We didn't hear noise from ANYWHERE!! Balcony View - Give comments on view, noting if location of any obstructions was an issue. – No obstructions at all. Balcony Size? Normal or oversized for class? - Normal. Just a small table and two chairs. Was wind a problem? - Not really a problem, but I did put two flags on our balcony window and one morning we woke up and one was gone. Any specific problems with this cabin? - None what so ever! Any other comments? - Great cabin. We'd book it again in a heartbeat. Balcony View - Give comments on view, noting if location of any obstructions was an issue. – Forward View was great, Aft View was impaired by hump cabins. Any other comments? - Within easy access to Centrum elevators and stairway. Muster Station is on Deck 5. Quiet Stateroom? (With comments on problems) – Quiet, no problems. Any other comments? - Mid ship. Near elevators. Pullman bed. Any other comments? - End of a hall. Mid ship. Great location behind elevators. Balcony View - Give comments on view, noting if location of any obstructions was an issue. – Good view. There is a bit of an obstruction if you attempt to look aft, as the balcony is on the front edge of the hump. Balcony Size? Normal or oversized for class? - Normal size for cabin catagory. Any specific problems with this cabin? - Noise can be a problem from the pool deck on deck 11. Any other comments? - Cabin features a double slider door that opens to an opening of about 7 or 8 feet total width.